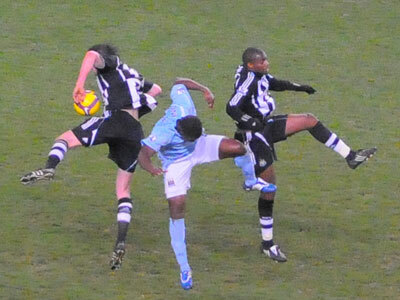 City made hard work of this win against a poor Newcastle United side. After a rather one sided first half in which City played some good football Newcastle had more of the play in the second period and their late goal caused some concern for home supporters. The debuts of new signings Craig Bellamy and Nigel de Jong went really well. 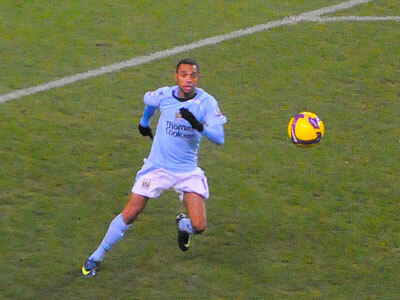 Bellamy as expected was a live wire up front all game and took his goal with great aplomb. With Given not playing for Newcastle it looks like he will be the next signing. Robinhogate loomed once again and despite the latest issue our record signing made the first goal and kept Barton busy most of the game. Once again Zabaleta played in midfield and looks quite at home while Kompany was give the skippers armband in the absence of the suspended Dunne and once again played well at the centre of defence with the exception of one bad pass back. SWP scored his 6th goal of the season and took some punishment from defenders but managed to almost last the game - hope he's fit for Stoke. Onuoha did well in place of Dunne and I hope we keep this unassuming gifted defender. Ireland was a bit out of touch and tried too many back heels and needs to get on the same wavelength as Bellamy who makes runs early. However all things considered a promising performance. At least we are back in the top half of the table while long term injuries to Owen and Barton may hasten Newcastle United's arrival to the bottom three. 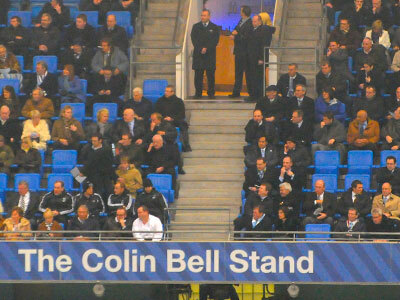 There were a few gaps in the visiting supporters section and only a few bare chests! 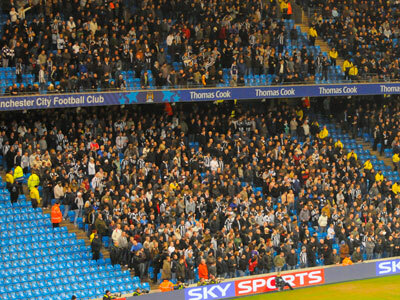 Are the Geordie faithful becoming disillusioned ? Newcastle Chairman Mike Ashley was easy to spot with his white shirt . Everybody else were well wrapped up! SWP uses his height in the tussle with Enrique! An Ireland shot was easily saved by Harper. 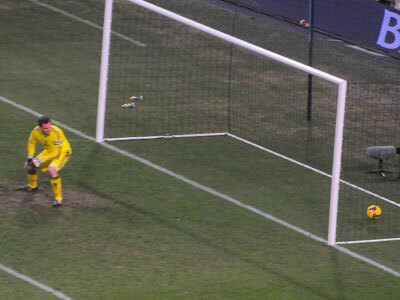 Robinho's free kick goes over the wall and the bar! Is this our last look at Michael Owen as Hart catches a cross ? After 18 minutes City scored. 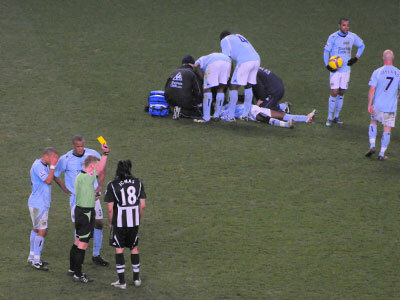 A cross from Wayne Bridge found Robinho who put the ball behind the defender for SWP to run onto and shoot under the legs of Harper from a narrow angle. It was a simple but well taken goal and well deserved as City had dominated the game with some nice inter passing. There's a Duff in there somewhere! Good job that boot was not off the floor Joey ! 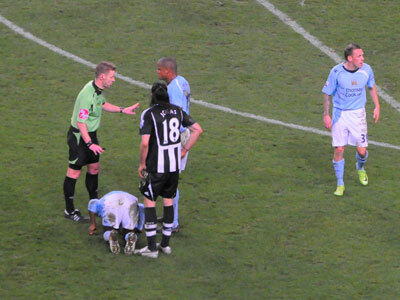 A Barton response after a word of warning by referee Jones who was using a lot of common sense - that's a change ! Carroll attempts a leap into space! 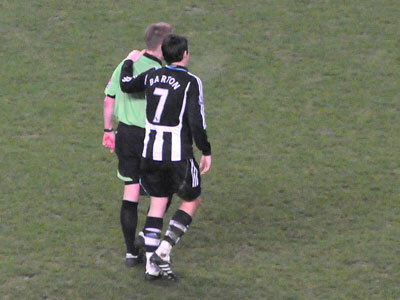 After 60 minutes the injured Barton left the field applauding the booing City supporters! 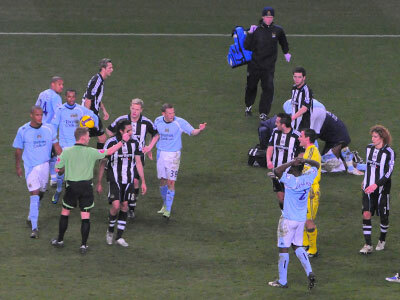 ....... then Bellamy makes his point to the opposition and eventually the yellow card is produced. 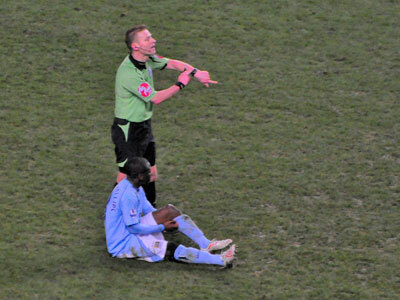 Many referees would have given a red one! 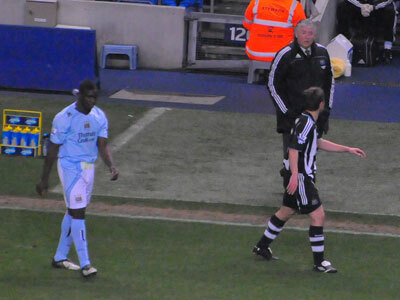 An individual run by SWP ended with another penalty shout but at least the referee was being consistent! With ten minutes to go disaster struck (that's new for City!) . Bridge made an error on the left being dispossessed by Edgar when he should have cleared. The cross by Edgar was easy meat for Carroll to score easily. Now come on lads hurry up ! The caretaker will be here to lock-up at 10! Leading contenders for the SDDC ( Soccer Disco Dancing Competition) !